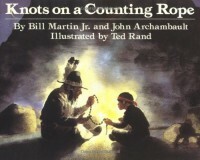 Another problematic picture book about American Indians. Really disappointing 1. that there are so many out there and 2. that Ama bought so many. I really don't know what I'm going to do with these books. To read more about the problematic aspects of this book, you can look here (just do a search for the title).